I figured I should just work the alphabet into my rotation instead of using it as a back-up. I mean I'm nearly finished now. Just R, S, T, U, V, W, X, Y, and Z. Well, that's actually not that few, is it? Anyways about Q. itself. 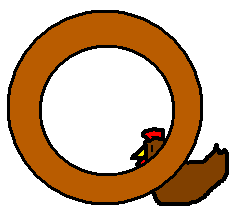 I made it with an O then I added the tail, but the tail is a chicken. That's pretty good, huh? 'nother good one :) The alphabet series is really delivering.